Tasty Trials: Trick or Treat? Last year I was thrilled to finally pick up a bottle of Pumpkin Spice liqueur. I knew it was out there, but I hadn’t been able to find it. So when I saw it at the store, I grabbed a bottle and started thinking about all the yummy pumpkin martinis I would make. I got home and found several different recipes online to try out. Much to my surprise, they were all disappointing. I tried to doctor them to no avail, and eventually gave up. I hadn’t thought much more about it until I started seeing pumpkin recipes pop up everywhere and I was reminded of that lonely bottle of Pumpkin Spice liqueur sitting in the cabinet. It was time to take matters into my own hands and perfect the pumpkin martini. Since I’ve been seeing a lot of chocolate-pumpkin desserts and have never combined the two flavors myself, I thought it seemed like a good place to start for a cocktail. Can you really go wrong when adding chocolate liqueur to something? No. Put all ingredients into a shaker full of ice. Shake and strain into a glass. This is a festive drink with its bright orange color. It also tastes great. You first taste the pumpkin spice, with the chocolate coming in at the finish. It goes down very smoothly. To me, this martini could double as dessert. So which would I choose: “trick or treat?” I will always take the treat, especially when in martini form. I've never seen pumpkin spice liqueur before! I picked up some pumpkin extract to make fall cocktails...although I haven't tried it yet! I just love this! I started clicking buzz so many times it almost didn't bring me to the post. How very cool and what a chic photo! Oh wow .... sounds fantastic! Sounds like a wonderful drink! I would enjoy this for dessert ;)! Love your martini glass by the way! This is so cute! And it sounds really tasty. Yes please! I adore everything about this drink. So glad you finally found a winner with the pumpkin spice liquor and even more glad you shared it! Love it...sounds like my kind of drink. The photo is so cute, too! Wow! Beautiful pics! I'm no much of a martini drinker, but this one is darn tempting! The one problem I have with martinis is that they are too darned good. One leads to another and another....dangerous drink. 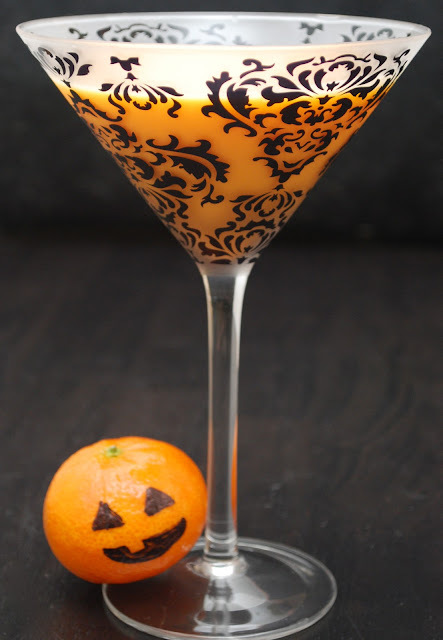 Your chocolate pumpkin martini would certainly lead to many an indiscretion on my part. But, then again, it IS Halloween..what better time? LOL I would have loved to have seen you after taste testing all of the martinis! Must have been a fun night! So festive!! Yum! This cocktail looks fantastic! I've never heard of pumpkin liqueur, and I really love the addition of the white chocolate flavors too! Wow, what a great drink! I love the color and just reading the combination of flavors...yum, smooth and sweet! 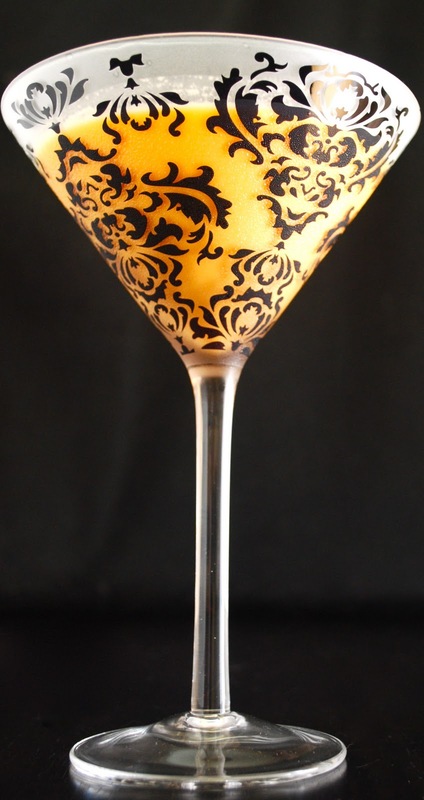 I think I need to start test driving some of these cocktail recipes..
this is the most gorgeous martini I have ever seen! What a great idea!!!! I love it!!!! I must taste amazing! Oh my goodness, Karen, this sounds fantastic. I love a good cocktail. If I can find the pumpkin spice liqueur around here (and that is a BIG if), then I will make this. I am buzzing this, you really do have such a great blog! Wow, this adds another dimension to the martini book! I gradually started to try martinis and now, I cursed all the years I kept ordering wine to be on the safe side! Cool glass by the way! What wonderful flavors in this drink. I never knew there was a pumpkin liqueur either, but the drink loos wonderful. This is awesome! I am going to share this with my friend who is having a party this weekend! I had no clur there was pumpking liquor out there! I suddenly want to throw a Halloween party just so I have one of these.... they look INSANE!! Great idea for a cocktail! Ok.. is it bad to want one of those at 6 in the morning?? YUM!!! Oh that just looks amazing! I loooooove the martini glass! Great, another liqueur to hunt down lol. Love the glasses. Love the cute martin glass...but love the yummy Pumpkins Spice Martini more! Sorry about the typo! LOL...I was too fixated on the MARTINI! Where can you get the pumpkin spice liquer? That sounds so good and I'm not a big drinker! That glass is lovely! Great photo. I've never heard of this Pumpkin Spice liqueur, but I know it must be fantastic; the name gets me excited. Martini tasting is one of my favorite kitchen activities, too. Those glasses are gorgeous! So now I am on the hunt for Pumpkin Liqueur. Who knew there was such a thing? Pumpkin liqueur? I NEED to check out my local stores of it. I don't think I've seen it before. This recipe sounds so good. Oh man this martini sounds delicious! I've never seen the pumpkin liqueur but I think I'm going to be on the lookout for it now! I've never seen pumpkin liquer! I love your glass it's so pretty. Next time you need a tester, let me know, I'd be happy to lend some assistance! The Martini looks heavenly! I love the glass and the little pumpkin such a cute photo. Chocolate, no you can never go wrong adding it. I have never seen a pumpkin spice liquer before. It does sounds special! Fantastic! What beautiful photos and the cocktail sounds delicious. Totally love the prop!! Oh yum!!! I was first introduced to chocolate and pumpkin 2 Thanksgivings ago.... heavenly combo!!! love it in a drink!!! You should try your pumpkin spice liquor in eggnog too! We have a local dairy here that makes pumpkin spice eggnog and it's incredible! Awesome with nutmeg and bourbon, and awesome in coffee! oh man, seriously the perfect way to celebrate haloween! Your drinks are always fantastic! I love them! Oh my goodness I am in love with this drink!!! I must try one this Saturday night to celebrate Halloween eve! What a COOL add! Karen, I have an award for you. Please feel free to hop over to collect it. Thanks and hope you're having a wonderful day. Love the color on this! I'm sure that the chocolate and pumpkin flavor combo tastes awesome as a martini. Those glasses are perfect too--so halloween-y! Hi Karen, I just wanted to pass on a lovely blog award to you! Come see me! Have a great day! That picture just WARMED MY HEART!!! And that's NOT even the liquer talking!!!! LOVES IT! Lovely presentation, love the glass out there. Like the drink. I was going to quit drinking until you posted this!